For the 30th anniversary of the Trenton Computer Festival 2005 they invited the new retro computer hobbyist group MARCH to have an exhibit and I and about 7 other people brought machines from their collection. 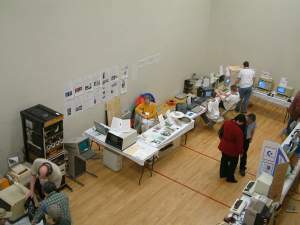 Pictures of my machine and the other exhibits are linked to below. It was a lot of work putting an exhibit together and hauling 700+ pounds of obsolete computer equipment from my basement and back but worth it. We had a good crowd interested in the various machines on display and reminiscing about using them. After getting another extension cord run to the room and getting all the wiring straightened out I got my machine up and running. Then my power strip gave up the ghost. I don't think my machine will be getting an energy star label. The exhibit was taking over 20A with everything on. Replacing the power strip and moving the Teletype to another cord got my exhibit up for people to play with. Only the Tektronix 4010 was acting up but it was working half the time. I have since found and fixed the bad connection. The following picture links below also have descriptions of what is shown in the pictures.